The University of Missouri’s Museum of Art and Archaeology exists to “advance… understanding of artistic and cultural heritage through research, collection and interpretation. [They] help students, scholars and the broader community to experience authentic and significant art and artifacts firsthand and to place them in meaningful contexts. [They] further their mission by preserving, enhancing and providing access to the collections for the benefit of present and future generations.” With a staff of 12 (including part-time and student help), the Museum staff manage a collection of almost 16,000 objects, with a particularly strong antiquities collection. Dr. Alex Barker, the Museum’s Director, and Dr. Linda Endersby, Registrar, leverage Argus to support several strategic imperatives: the broadest possible online access to their collections, mobile functionality for staff and visitors, reporting on-the-fly, social tagging that supplements natural language search, the flexibility to accommodate the unique requirements of antiquities cataloging (e.g., describing time is very complex), and expanded curation through links and file attachments that enrich the understanding of each object. Prior to the recent Argus implementation, there was limited access to collections data even for museum staff because the system was available only via two standalone computers. It’s especially important for a teaching or research museum to provide constant access for students and faculty, allowing them full enjoyment and use of the collections when they wish and how they wish. With a fully web-based system that is browser and device agnostic, the access imperative is answered. The museum is temporarily located offsite, but the balance of research instruction goes on at the main campus, even over the phone or via laptops; with Argus it’s no longer necessary for museum staff or their materials to be physically present. Dr. Endersby shared a story of how a curator who teaches on Renaissance art could pull up museum materials and use their collections to answer questions on-the-fly during a lecture. Other faculty members are converts too, once they see how quickly and easily they can search the collections, create lists of objects, and link to expanded information about those objects. “...the ability to add all of the visual content you want, in any form, including non-static media, is just great. We can enable students to do full analyses of objects; the ability to capture all the related links, text resources, and audio-visual materials is very attractive." The phrase carpe diem, quam minimum credula postero, translated as “Seize the day, put very little trust in tomorrow,” can be interpreted to mean that one cannot trust that everything is going to fall into place; one must take action for the future today. 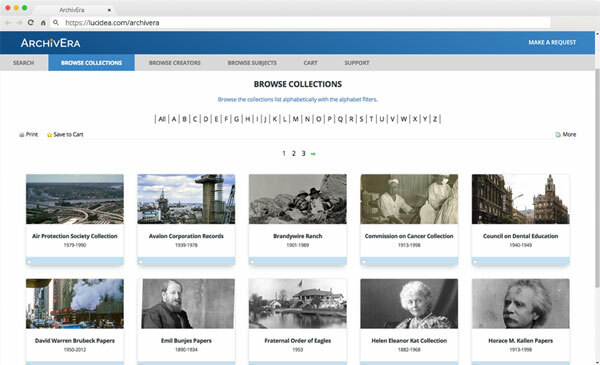 With Argus, not only did the Museum of Art and Archaeology seize the opportunity created by their unexpected move, they have taken action for the future with a purpose-built, exible, scalable and extensible collections management system that meets today’s strategic imperatives—and will also meet tomorrow’s.